I'm BonKyuBOMBGIRL, but you can call me Dana. :) I have been cosplaying and attending conventions since 2003. At age 15, I taught myself how to sew. After graduating high school, I studied Finance for a year and a half before making the tough decision to switch schools. In 2014, I graduated from Columbia College Chicago with my Bachelor of Fine Arts in "Fashion Design". Aside from sewing and garment construction, I am knowledgeable in pattern making, pattern grading, draping, tailoring and corsetry. In 2016, I moved to Los Angeles and worked for Universal Studios Hollywood to help them make costumes for Halloween Horror Nights. During my time there I also got to do some theater work, including Dan Castellaneta's "For Piano and Harpo". In 2017, I moved back home to Chicago and turned my focus onto building my own business. Judge's Choice Hall Award: Anime Central 2008, Bad Girl from No More Heroes. Runner Up Best Group: Anime Central 2013, Bunny Girls from Haruhi Suzumiya & ToraDora! Best in Master Craftsmanship: Anime Midwest 2014, Bad Girl (Revamped) from No More Heroes. Best Craftsmanship Saturday Hall Award: Anime Central 2014, Gantz. Judge's Choice Award: Anime Expo 2014, Gantz group. Stanley Paul - Raelene Mittleman Fashion Foundation Scholarship Award 2014, Senior Thesis. 2nd Place in "Movies & Television Category": Crown Championships of Cosplay at C2E2 2015, Katniss Everdeen Wedding Dress. 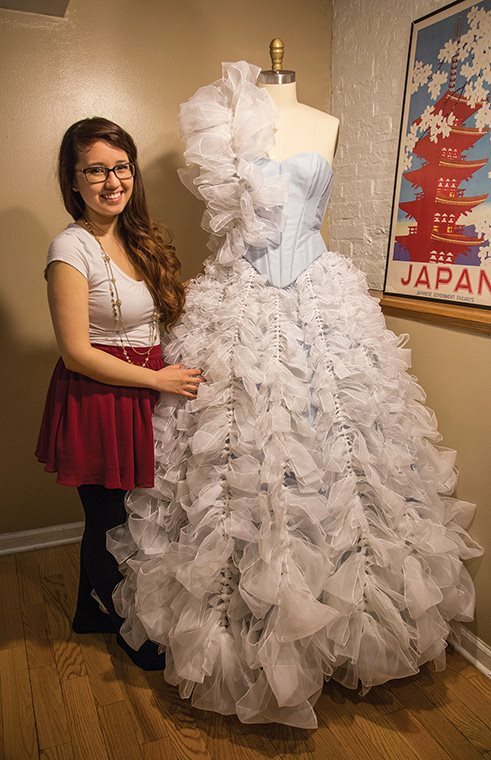 Runner Up in Master Craftsmanship: Anime Central 2015, Katniss Everdeen Wedding Dress.